After this weekend’s near-disaster, we will be giving thanks for hot water at Thanksgiving this year. We awoke Saturday morning to find the water pressure in our house had suddenly dropped to a pathetic trickle, which of course happened on the day we were expecting company. We had big plans to cook with our friend Soe, who was the winner of this year’s Saveur Blog Award for Best New Voice. His beautiful website, Lime and Cilantro, is filled with stunning photography and delicious Burmese recipes including the chickpea tofu he planned to make for the dinner. All this week, we have been cooking up a storm, testing new recipes left and right, and our sink was piled high with dishes from the night before. There we stood, unshaven and unshowered, in the middle of our war zone of a kitchen with no water pressure, and our guest arriving in less than two hours. So what happened next? Well, there was just enough water to clean the dishes, but the real highlight of our day was the ice cold shower dribbling out like a broken drinking fountain, leaving us shivering and struggling to rinse off as quickly as possible. Good times. Thankfully, everything worked out; the water finally came back on moments before he arrived, and we had a great time cooking with our friend and watching him prepare an authentic Burmese salad with homemade chickpea tofu, which we can’t wait to share with you. We will never take hot water for granted again, and during this holiday of giving thanks, hot showers will be at the top of our list. And speaking of this festive holiday which is quickly approaching, we have a side dish to share with you today that is a Thanksgiving game-changer. You may want to sit down for this one. Allow us to tell you how these magnificent taters were born. We were thinking of side dishes to make for Thanksgiving this year, and couldn’t decide between mac and cheese or mashed potatoes. Deep conversations indeed. And when we thought to combine them, a bright white light shined through the windows and the sound of singing angels filled the room. But it gets better. Everybody knows Martha Stewart’s Perfect Mac and Cheese recipe, and if you don’t, we highly recommend it—once you’ve recovered from this week’s festivities. It’s the creamiest and cheesiest mac and cheese you could imagine, which inspired a curious idea: what if we started with her recipe, but instead of macaroni, we used mashed potatoes? Well the radiant light illuminated the house again, the angels sung even louder this time, and we knew we had created a masterpiece. We’ll never be able to have plain mashed potatoes again. 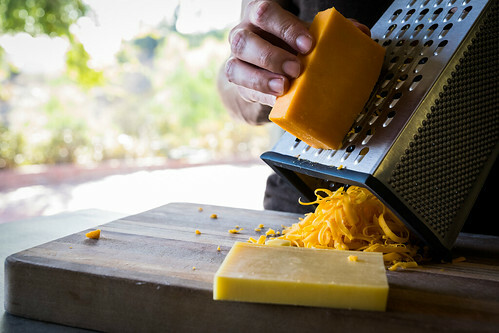 How could we, after discovering how glorious they are oozing with melted gruyère and sharp cheddar. 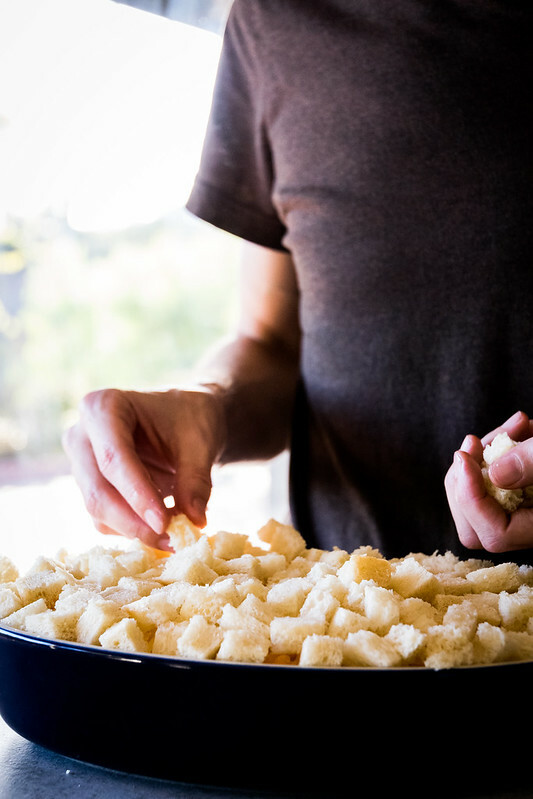 Seasoned with freshly ground nutmeg, and a pinch of cayenne pepper, these buttery potatoes are then sprinkled with another layer of cheese, topped with homemade croutons, and baked until golden and perfectly crispy. Ultra creamy and garnished with minced chives, please welcome the newest member to your Thanksgiving table. As impressive as this show-stopping side dish is, it couldn’t be easier to pull off. 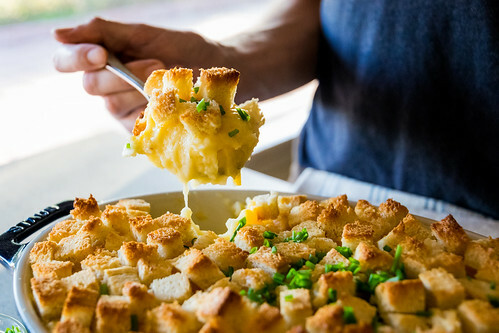 You cook the potatoes until tender, add cheese and seasonings as you mash them, then top it with extra cheese and croutons and bake! Almost as simple as plain mashed potatoes, but with infinitely more flavor! Plus it’s perfect for Thanksgiving—a day when oven space is in short supply—because it can be assembled ahead of time and baked quickly just before you eat. Many of us end up repeating the same family-favorite dishes for this annual feast, but after bringing this new creation to the table, golden brown, and bubbly with melted cheese, we guarantee that everyone will be extra thankful this year. Preheat oven to 400ºF. 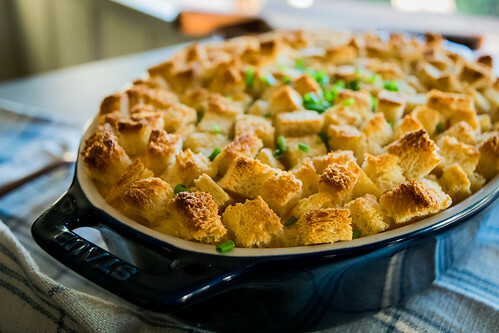 Grease a 9×13-inch baking dish, and set aside. 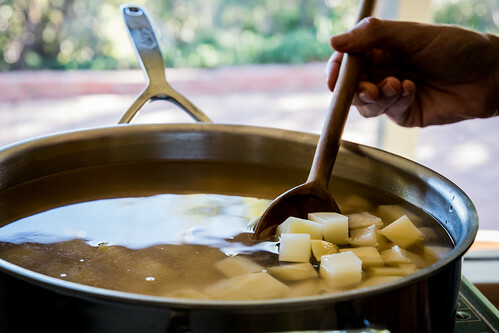 Place the diced potatoes in a large saucepan, and add enough water to cover them by a few inches. 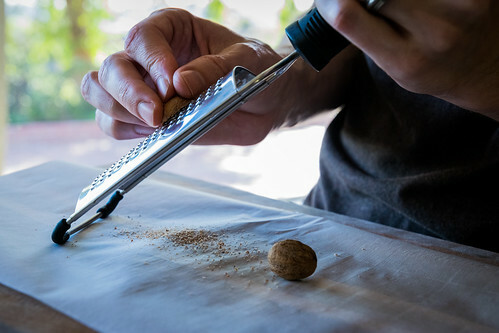 For each quart of water used, add 1/2 teaspoon of salt as well. 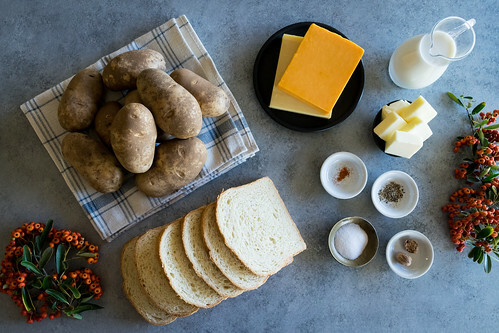 Place pan over high heat, bring to a boil, then reduce heat and simmer, stirring occasionally, until the potatoes are completely tender when pierced with a fork, about 15 minutes. Drain into a strainer, then return the potatoes to the pan. Using a potato masher, mash the potatoes for a minute or two to release the excess steam. Then add the warm milk, melted butter, salt, nutmeg, pepper, cayenne, cheddar, and gruyère, and continue mashing and stirring until smooth and creamy. Transfer the mashed potatoes to the prepared baking dish and spread them evenly. 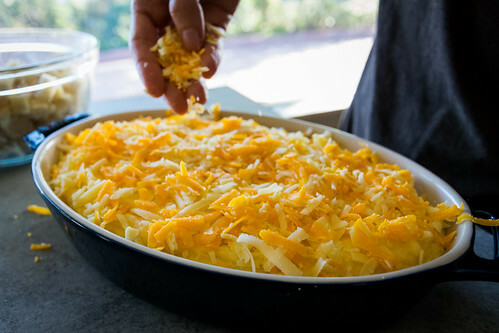 To prepare the topping, scatter the grated cheddar and gruyère evenly over the top of the mashed potatoes. 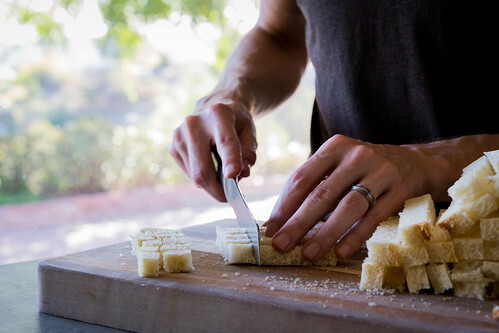 Place the bread cubes in a medium bowl, and pour over the melted butter, tossing gently to coat the pieces evenly. Cover the top of the potatoes with the bread pieces, arranging them evenly over the surface. Bake until browned and crispy on top, about 20 minutes. Sprinkle the top with minced chives if desired, serve hot, and enjoy! 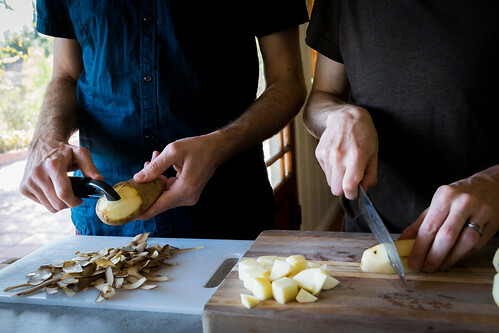 — We use russet potatoes, as we find their fluffy texture to be perfect for mashing. However, feel free to use other varieties like Yukon Gold if you prefer. 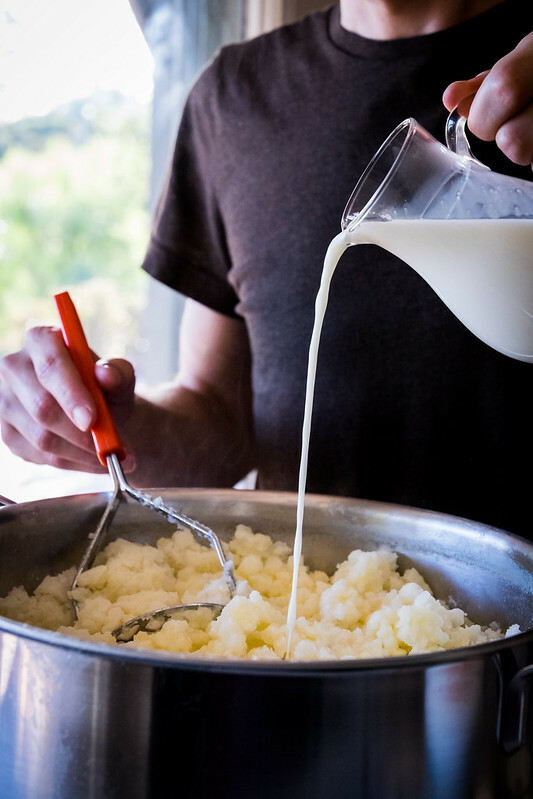 — Mashing the potatoes briefly before adding the other ingredients allows excess steam to escape, which helps make them even more creamy. 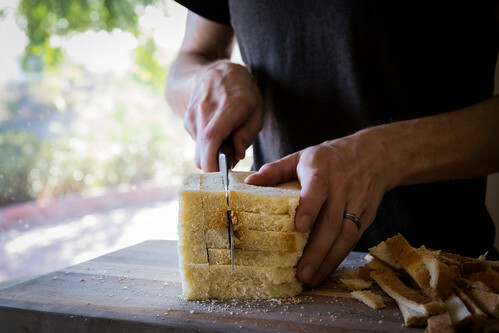 — To make this gluten-free, simply use a gluten-free bread to make the topping. Thank gosh the water came back on guys! I saw these potatoes today on IG and I think I immediately started drooling! They look absolutely amazing. The topping puts these over the top. I can’t wait to try. Hope you have a wonderful Thanksgiving! Thanks so much Mary Ann! We had a wonderful thanksgiving up in Portland with our family! Hope yours was filled with smiles, laughter, and delicious food!